A basketball-sized lava bomb slammed through the roof of the boat "Hot Spot" (pictured) near an active fissure of Hawaii's Kilauea volcano in July 2018, showering the vessel with debris and injuring 23 people. 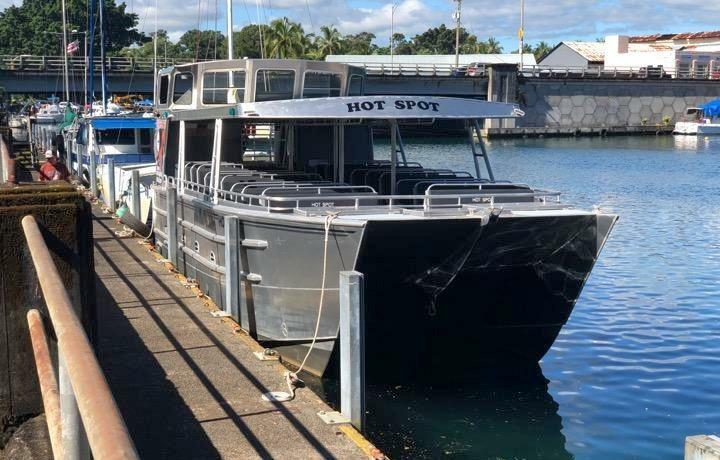 A group of sightseers injured by a "lava bomb" during a boat tour in Hawaiʻi have filed a lawsuit. The suit was filed on the Big Island against Lava Ocean Tours Inc. and captain Shane Turpin, Hawaii Tribune-Herald reported on Wednesday. Authorities said 23 people were injured in July 2018 when the tour ship called Hot Spot was struck by molten rock. The lawsuit filed on behalf of six passengers from California and Oregon follows a suit by an Illinois woman. Both lawsuits said the captain maneuvered the ship dangerously close to lava and the company did not adequately warn passengers of hazards. A lawyer representing Turpin declined comment citing the pending litigation. The plaintiffs are Erin Walsh and William D. Bryan Jr., an Oregon couple, and Californians Dawn Li— on her own behalf and on behalf of her minor son, Christopher Li— Dr. Ka Ming Li, a trauma surgeon and Dawn Li's husband, and the couple's adult daughter, Erica Li. Ka Ming Li and Dawn Li were near the front of the vessel when the lava hit, while their children were in the back. Ka Ming Li helped attend to Jessica Tilton's injuries as his own children also were injured, according to Robbins. "The children . are not just going through the medical treatment for the burns," Robbins said. "The parents are receiving therapy for the emotional distress they endured from watching their children being injured on a family vacation in the islands. And (Bryan) and Erin Walsh, they're receiving treatment, as well." Another suit was filed in Hilo Circuit Court last month by the family of Jessica Tilton, a 20-year-old Illinois woman who was left with broken bones in her leg and pelvis.